This new publication was inspired by the desire to commemorate the 25th Anniversary of the founding of the Section on Business Law of the International Bar Association. 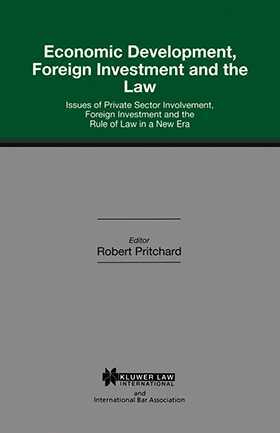 Practising lawyers from all over the world have contributed to this book with their knowledge and expertise. The issues involved in the economic development process have been pursued with a practical approach. Bearing in mind that the legal system of each country is unique, that many countries are currently undergoing major programmes of legal reform, and that most development issues are country-specific, this study does not make any claim to comprehensiveness or coherency of treatment. If the book helps to accelerate reform efforts, it will have achieved a useful purpose. It is hoped that it will serve as a source of practical information for a wide range of people interested in the legal aspects of development and investment issues, including the special issues associated with the use of foreign capital.